Airspace Saver Daily Cover exclusively provides tarps for The Automatic Tarping Machine (ATM). The Automatic Tarping Machine (ATM) is a self-contained unit that enables various types of equipment to hydraulically unroll and roll back up different fabric panels. Each ATM is custom-fit to be lifted and transported by the blade of a dozer and offers quick and easy hook up. The product uses a hydraulic drive motor and engaging system to wind and unwind the spool with variable speed control. Spools can be disconnected and reconnected to utilize one ATM with multiple spools. Controls are mounted in the cab of the dozer to give the operator control of the engine, height of the spool, and forward/reverse rolling. Utilizing the capabilities of the dozer, the operator also has control of the ATM height and tilt. 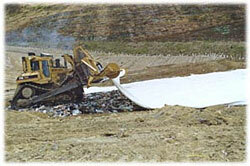 This allows for even tracking when winding and unwinding tarps on uneven terrain. The product is available in three different sizes to accommodate 40, 45, and 50-ft. wide panels of various lengths. Airspace Saver Daily Cover, P.O. Box 77757, Baton Rouge, LA 70879. Tel: 800-6731570; Fax: 225-755-3448.